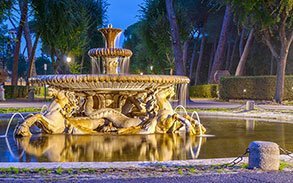 Getting bored is out of the question at Villa Borghese: green areas, fountains, the zoo, museums, Città del cinema, theatres and attractions for children. All these features make Villa Borghese romans’ favourite park. Its central position allows tourists to get there quickly and easily and spend a few relaxing hours. Break from the daily chaos. Let go of the city chaos and enjoy the most famous park in Rome. It’s the third biggest in Rome behind Villa Doria Pamphili and Villa Ada. It’s green, elegant, scenic and it gives you the chance to relax after a long walk, to go for a pic nic or to sit on a bench and read a book. Romantic walk to Pincio. The walk to Pincio, the first public park in Rome, conceived by Napoleon Bonaparte, is Romans’ most loved walk. Couples of every age range walk hand in hand passing by monuments and busts of famous people. Finally, they can stop and admire the romantic scenery of Piazza del Popolo and Prati neighborhood. Rent a rickshaw. An overwhelming temptation for those who wish to tour Villa Borghese is to rent a rickshaw. The renting points are located in Viale Goethe, Viale dell’Uccelliera and the entrance of Viale Belle Arti. Fun for everybody. At Villa Borghese boredom is not an option. sports lovers can rent a boat on the lake, they can enjoy the horserace of the Palio of Piazza di Siena or they can rent a bike for a comprehensive tour of the Villa. Areas for children. Villa Borghese is children paradise. The Villa features rides and carousels in Viale Goethe, games in Viale Madame Letizia (entrance in Giardino del Lago) and the small train for touring the Villa, that takes off at Viale Goethe. The zoo. Children appreciate the zoo, that features animals and plants from all over the world as well as dedicated areas for instructional activities, fun activities, picnic and games. Where to go? 80 green hectars of fun to be enjoyed. So “now what”? Look for information on the city’s tourist portal about itineraries for families and itineraries for youngsters. Carelessness. Over the last few years both romans and tourists have complained about the state of neglect of the Villa, also in terms of hygiene. It’s source of shame and sorrow for all regulars of the Villa. We really hope the situation is brought back to normal soon. Galleria Borghese and Bilotti Museum. 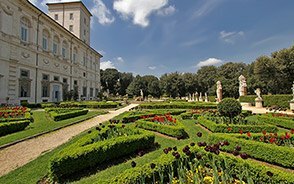 Art lovers can have a blast by visiting the Museum and the Galleria Borghese which features sculptures by Bernini and Canova and paintings by Caravaggio and Raffaello. Furthermore, they can visit the Carlo Bilotti museum, located in the picturesque orangery. The museum features works by De Chirico, Severini, Warhol, Rivers and Manzù. Cinema. Theatre and Movie lovers can visit the Casa del Cinema (House of cinema), that, since 2004, features exhibits and festivals or the Globe Theatre, that since 2003 is the place to be for lovers of the Elizabethan theatre. Theatre of Puppets. San Carlino’s puppet show is the biggest attractions for all children of Rome. From mid September to June every weekend and on non-working days the Theatre features shows for the whole family. Il Cinema dei Piccoli. Villa Borghese features Cinema dei piccoli (Kids’ Cinema), the tiniest theatre in the world. Every afternoon the theatre features two movies or cartoons to a really young audience. Hat, comfy shoes and a camera. These items are a must in the Villa (but outside the Villa too…). If you’re planning to spend the whole day there you may want to bring food and accessories for a nice pic nic. Don’t forget to throw the trash in the garbage bins. Access to the park is free of charge. Access to museums, theatres, cinemas, boats, bikes and other main attractions is not. Entrance. The villa has 9 access points: via Aldrovandi, via Raimondi (2 entries), via Pinciana (2 entries), piazzale San Paolo del Brasile, piazzale Flaminio, piazzale Cervantes, piazzale Pablo Picasso (via di Valle Giulia). Subway: Take the A line and get off at Flaminio or Spagna. Then follow the directions. Bus: The 89, 150, 490 and 495 lines drive across the villa. The 52, 53, 217, 223, 628, 910 and 982 lines stop by the neighboring streets. Tram: Take the 2, 3 or 19 lines. Railway: Piazzale Flaminio stop (Rome-Viterbo line).